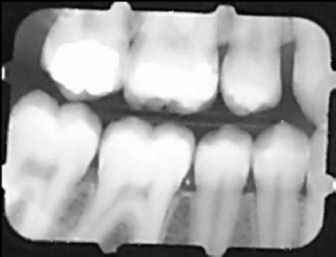 FIGURE 4 (a) Original bitewing X-ray image. (b) Original image in (a) corrupted by added Gaussian white noise with maximum amplitude of + 25 gray levels. (c) Image in (b) convolved with the 3x3 mean filter. The mean filter clearly removes some of the additive noise; however, significant blurring also occurs. This image would not have significant clinical value. (d) Image in (b) convolved with the 9x9 mean filter. This filter has removed almost all of the effects of the additive noise. However, the usefulness of this filter is limited because the filter size is similar to that of significant structures within the image, causing severe blurring. image can result in an output image with both positive and negative values. An enhanced image with only positive pixels can be obtained either by adding an offset or by taking the absolute value of each pixel in the output image. If we are interested in displaying edge-only information, this may be a good approach. On the other hand, if we are interested in enhancing edges that are consistent with the kernel and suppressing those that are not, the output image may be added to the original input image. This addition will most likely result in a nonnegative image. 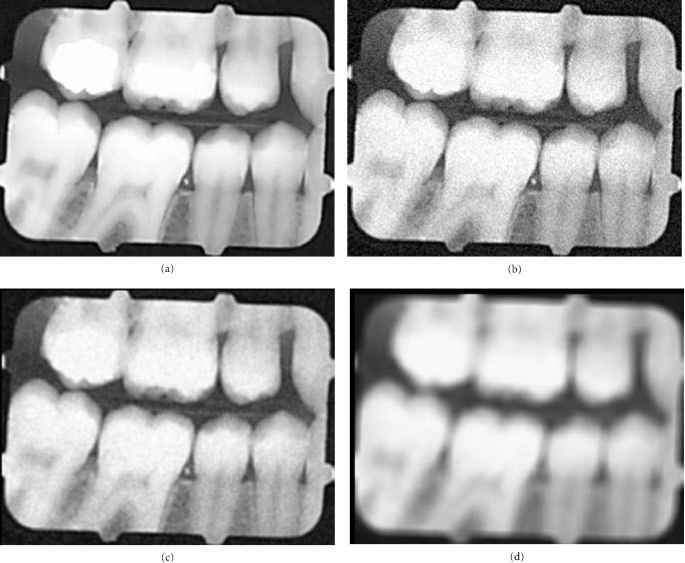 FIGURE 5 (a) Image in Fig. 4b enhanced with a3x3 median filter. The median filter is not as effective in noise removal as the mean filter of the same size; however, edges are not as severely degraded by the median filter. (b) Image in Fig. 4a with added shot noise. (c) Image in figure 5(b) enhanced by a 3x3 median filter. The median filter is able to significantly enhance this image, allowing almost all shot noise to be eliminated. This image has good diagnostic value. convolving the original image with the kernel after adding 1 to its central coefficient. Edge enhancement appears to provide greater contrast than the original imagery when diagnosing pathologies. Edges can be enhanced with several edge operators other than those just mentioned and illustrated. 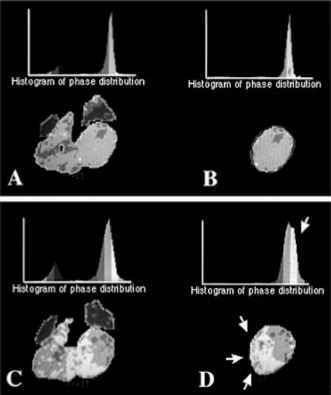 Some of these are described in the chapter entitled "Overview and Fundamentals of Medical Image Segmentation," since they also form the basis for edge-based segmentation. FIGURE 6 (a) Absolute value of output image after convolution of wm with the image in Fig. 3a. 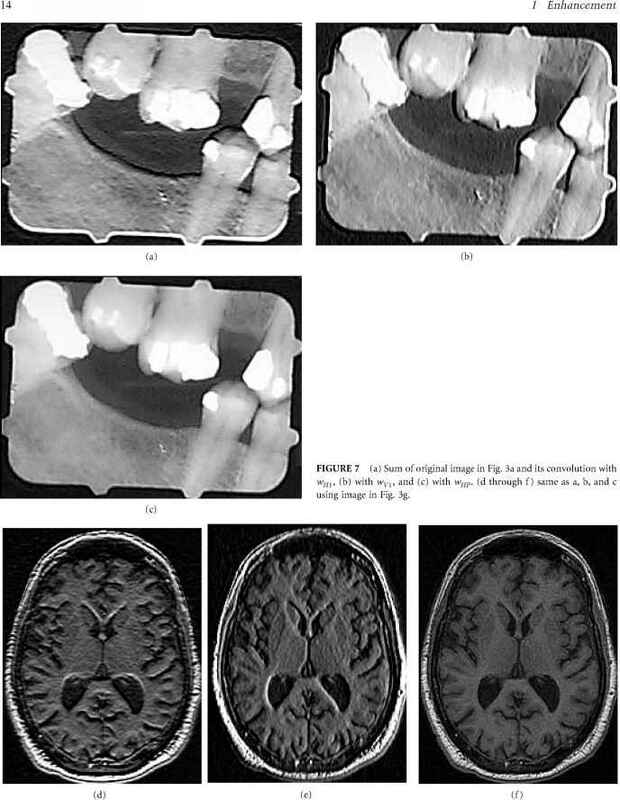 (b) Absolute value of output image after convolution of wvl with the image in Fig. 3a. (c) Absolute value of output image after convolution of wHP. (d through f ) same as a, b, and c using image in Fig. 3g. the image. The method formulated as shown next is applied at each pixel (m, n) of the input image.